Anyway, the book is about Muna and Sakti, who have washed up on a beach on Janda Baik without any knowledge of who they are except that they are sisters. Sakti has an abundance of magic, and Muna has none. They are sent to England (and the Sorceress to the Crown, Prunella Wythe) to seek out help for breaking the curse that afflicts them and to learn English magic, except Sakti goes missing in the fairy realm during their journey. Muna continues on to England and pretends to have magic as she seeks a solution. In England, she befriends Henrietta Stapleton, a teacher at Prunella’s school for magiciennes. After a friend of Prunella’s is taken hostage in the fairy realm, Henrietta and Muna embark on a quest to free him and also to find Sakti. 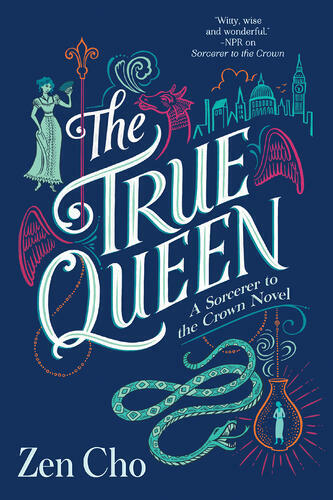 Cho writes fantasy in a way that resembles Georgette Heyer (if she wrote dragons) except without the bigotry and from the perspective of the colonized. She writes fantasy that centers marginalized people and makes them the heroes and victors. And I adore that. Her goal in these two books seems to be showing marginalized people not only at the forefront of Regency England, but also at the center of everything. Details on this claim amount to spoilers, so I’m zipping my lips. The book, like its predecessor, never swerves away from the bigotry of the time. It is there for you to stare at and understand because the characters have to live with the racism, misogyny, and homophobia. And yet, no one is defeated by the hatred they are forced to live with. They overcome and move on with their missions. They are the heroes. No matter how much I love this book, it is fair to say that it has a slow start. I have tried to decide if it’s just a matter of getting accustomed to the language or the story just starting slow or both, and I don’t have an answer. I will note that Sorcerer to the Crown is a book I reread and my love for it grows the more often I do. There are facets that only come into view when you’ve seen the whole. I imagine this will be true of The True Queen too. And here I leave you with a book that is not a romance, but contains one, and is one of the queerest and most diverse Regency-set fantasies you may ever read.